And it doesn’t really matters whose court records or where or why… there is always a story to be told. For some reason, The Legal Genealogist ended up poking around in records of the New Plymouth Court last night. No, not Plymouth. As in Massachusetts or Ohio. Yes, I am going back there — I’ll be speaking at the 50th anniversary celebration of the New Zealand Society of Genealogists in Auckland 2-5 June. Because, in those court records, just as in court records everywhere, there is always a story to be told. Case in point: the story of the O’Hanlon family, where the mama wasn’t happy — and it ended in a family feud. Pretty straight-forward, right? Married woman dies, husband takes over. Now… that’s a pretty good story all by itself. But the story of the law itself that Rose used to protect herself is a good one too. Not quite relevant to the matter of property, but certainly to the matter of women’s rights: NZ was the first country to extend the franchise to all women over 21. This was in 1893. The 1893 suffrage for women in NZ was noted in the blog post, Graham! 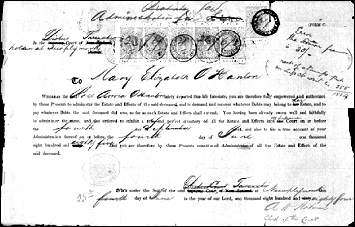 Charles Patrick & Rose Anna O’Hanlon are my Gt Gt Grandparents and I have had a very interesting time researching them. Really excited that you found this an interesting episode to comment on. Charles Patrick was a very interesting character. He originally came to NZ in the early 1850’s and was a foundation pupil at Wanganui Collegiate; then went to Aust and married Rose Anne there and returned to NZ. I can’t find out why or how he came to NZ as a child – seems strange he went to school as it doesn’t appear his parents came here at all. Excellent! Glad you found the blog post — interesting folks!